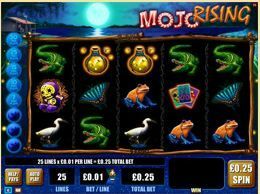 Mojo Rising at Slots Magic Casino is a 5 reel, 25 pay line video slot machine. 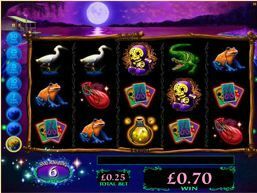 The game has colorful graphics that include gators, a witch doctor ,voodoo dolls, skulls, magical potions, toadd and fireflies.. The witch doctor is the wild symbol and he appears only on reels 2, 3, 4, and 5 and substitutes for all other symbols. Mojo Rising has the cascading reels feature. Instead of the usual spinning reels that you see with most slot machines, the graphics drop down from above. Symbols that create a winning payline disappear and new symbols drop down to take their place after the win is paid. Additional wins are then possible. This cascading action can continue over and over again, until no more new winning combinations are created. The free spins feature is triggered when you get at least four of the cascades consecutively in a row. The higher the number of consecutive cascades, the more free spins you win. 4 cascades will get you 7 free spins. If you get 8 cascades in a row, you can win 50 free spins! 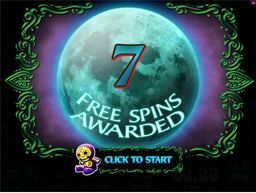 During the free spins, you will win additional free spins if you get 4 or more cascades in a row.